Mufti is an odd book, but a revealing one. Having made a reputation during the war with stories that portrayed the conflict in a tough-minded way (a tough-mindedness that was often taken for realism) Sapper bravely took on the task of writing a condition-of-England novel, set during the last three months of the War, and trying to make sense of the coming post-war world. He presents a country whose divisions contrast with the unity of purpose at the front. Arguments for the rising power of capitalism are put by Baxter, a fat dyspeptic maker of patent plates. Arguments for labour are put by the equally ruthless socialist, Ramage. In each case the argument is put strongly, but undermined by their characters. There is no common ground between them, and little sense of a shared humanity that might find a common ground. Sapper is unable to do what Buchan, for example, did – allow for a personal decency in characters whose views he disagrees with. The hero, Vane, is a wounded officer, and rather a self-pitying chap. A rentier with an income of £1500 a year (when the average wage was under £200) he looks for purpose in the post-war world, but has no impetus to do anything constructive himself. He is sorry for everyone hurt by the war, but never translates this into action. It’s an oddly impotent book. The hero is set aside by one girl because she wants to become a doctor. He becomes interested in another girl, Joan, but she is the scion of an ancient family fallen on hard times. In order to keep the estate together, she is going to marry Baxter, the fat dyspeptic who lives on rusks and Vichy water, to become his trophy wife and please her bankrupt father. Sapper, rather to his credit, takes this to its logical conclusion. No miracle stroke of good fortune comes to save the girl. She marries the millionaire, and the gloomy hero has to face the post-war world alone. It is implied that the hero could have prevented this if he had seduced Joan, but he was too decent to consummate his love when she offered the chance. True, the doings and the decisions on which she harped continually were for the benefit of the men he [Vane] had led. But to this woman it was not the men who counted most. They had to fit into the decisions; not the decisions into them..
he saw her whole body stiffen as if she had been struck; he saw her bite her lip with a sudden little gasp, he saw the colour ebb from her cheeks. Then she recovered herself. Prostitution is not a question on which Vane can take the moral high ground. Before the War, he had set up a mistress in a discreet flat (this is the reason why Margaret initially rejected him). He clearly divides females into two species, though, and what was all right for his shop-girl is all wrong for Joan. His relationship with her is awkward; they infantilise each other, calling each other “boy” and “girl”, and he defines their relationship according to ideas about “playing the game” which are clearly insufficient for the situation. A year after this uncertain book, Sapper was writing the immensely certain Bulldog Drummond. In that book, the male is assertive, and women conveniently divide into adorable victims who need to be rescued (like Phyllis) and evil and beautiful monsters, like Olga. Another of the assertive women in this book is a comic aunt with an ear-trumpet symbolising her inability to connect with what is really going on. She continually urges soldiers to kill, and is disappointed when Vane admits to having personally accounted for only two definite Germans and a possible third. She sees violence as the answer to everything – and is mocked for it. Yet violence will be Bulldog Drummond’s answer, for example in The Black Gang, where he and his cronies don black uniforms and hunt out and flog revolutionaries, Sinn Feinners and Jewish white slavers, with mucho macho gusto. It is as though Sapper has shied away from the emasculating complexities of the world described in Mufti, and has chosen the simplicities of violence instead. The immense sales of Bulldog Drummond must have encouraged him, and for the rest of his career he stayed in the thriller genre. I wonder if he felt restricted by this, though, and possibly diminished? 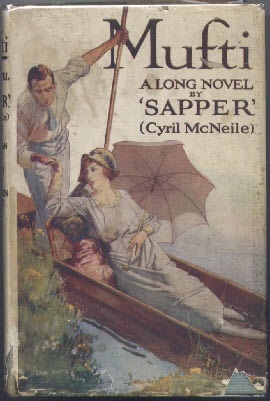 His publisher at Hodder wrote to Richard Blaker warning that Sapper was “the most sensitive man I know.” Was the sensitivity caused by being defined and categorised as a mere genre writer, when Sapper felt that maybe he could have been more, with this, the least financially successful of his works, as the proof? This entry was written by George Simmers and posted on October 14, 2007 at 12:32 pm and filed under novels, popular culture. Bookmark the permalink. Follow any comments here with the RSS feed for this post. Post a comment or leave a trackback: Trackback URL. Thank you for this detailed review. I am gradually (re-)acquiring up my ‘Sapper’ collection, primarily his thrillers starring Bulldog Drummond, Ronald Standish and Jim Maitland, along with his short stories, but this sounds fascinating, coming, as you note, just before he created the Bull-dog.